There are some occasions that call for show-stopping desserts — party food that will wow your guests and leave them talking for days. 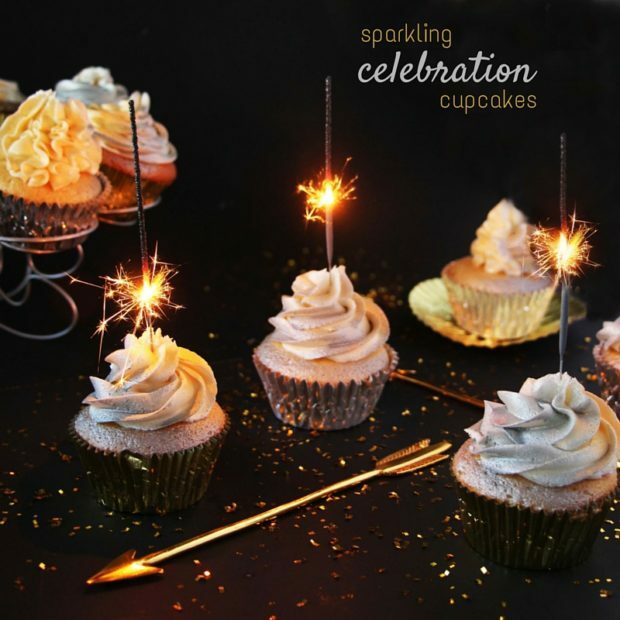 These Sparkling Celebration Cupcakes are one of those desserts! They’re a gorgeous choice for New Year’s or a special birthday or an anniversary. Join the fun side with these Storm Trooper Cupcakes. These Cookie Monster Cupcakes are perfect for your next party or just an every day treat. 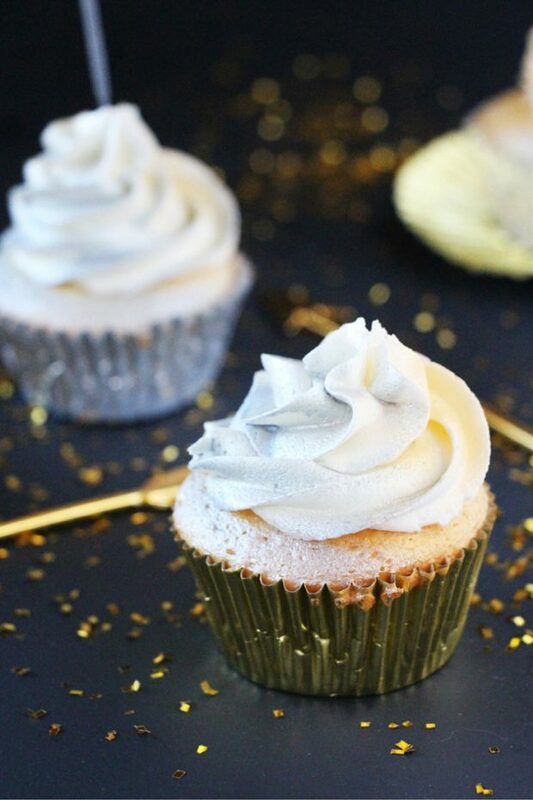 I also baked these delicious vanilla cupcakes in silver and gold cupcake liners to really bring the glamour. 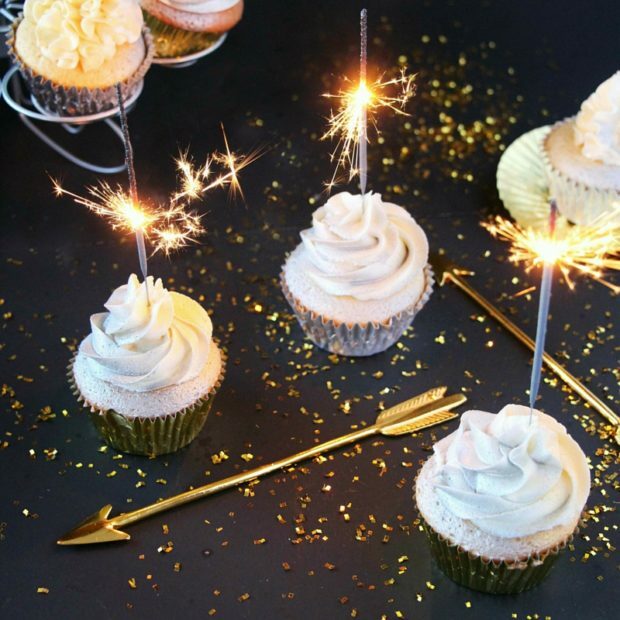 For presentation, leave the sparklers aside in a cute cup or jar until it’s time to light them up! It works best if you have a couple of barbecue lighters going at the same time. For New Year’s Eve we start lighting them up just before the 10-seconds-to-go mark. I made these vanilla cupcakes with vanilla buttercream from scratch, but if I’m pressed for time I sometimes just use a boxed cupcake mix. If you ask me, it’s all about the frosting – a great frosting takes any cake to the next level of deliciousness. 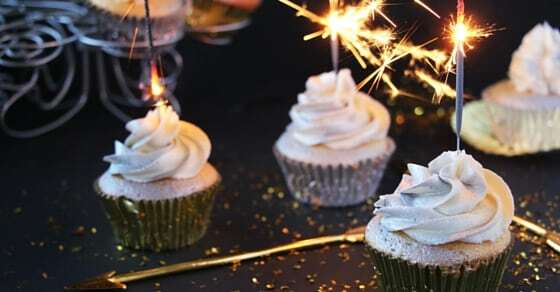 I tried making these with chocolate cupcakes as well, but I didn’t love how the silver and gold spray settled on the chocolate cake. The vanilla served as a nicer “base” for the color. Preheat the oven to 325F. Line a muffin tray with silver & gold foil liners. Whisk flour, baking powder, baking soda and salt together until combined. Set aside. Using a mixer, blend the sugar and oil until light and fluffy. Add in the eggs one at a time, then the vanilla, and the buttermilk. Add in the flour mixture in three increments, mixing completely in between additions. Portion the cupcake batter out into the liners. I use about 1/4 cup per liner. Bake 18-22 minutes, until an inserted toothpick is removed clean. Make the buttercream by combining the butter, vanilla, and 2 cups of the powdered sugar in a large bowl. Add in the cream and additional sugar in increments, until you reach a desired sweetness and consistency. I like to taste the contrast of butter and vanilla, while still having a stiff enough frosting to create gorgeous swirls. Fit a decorating bag with your desired frosting tip and fill with the buttercream. 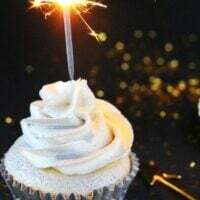 Starting in the center of the cupcake, and applying even pressure, swirl the frosting outwards, and then back towards the center for a gorgeous “domed” effect. 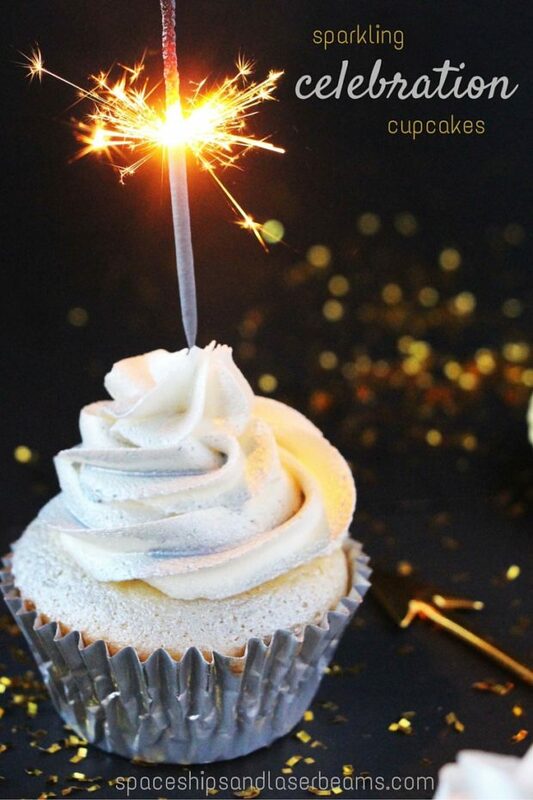 Spray half of the cupcake with silver food spray, and then the other half with gold. If you’d like, you can just use one color of the food spray and leave half of the cupcake white. Create delicious desserts with these great sources gathered by the crew at Spaceships and Laser Beams. Check out more great cupcake recipe ideas. This is a great classic recipe. Easy ingredients that make a delcious cupcake for any occasion. I got a big thumbs up from the kids for making this yummy treat!